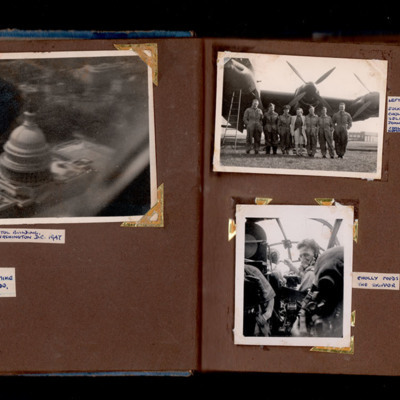 Photograph album containing 51 photographs of James Wrigley's family, training and post war service in the United States and the Far East with 97 Squadron. Half-length portrait of a woman. Bride and groom standing outside the church with six other people. It is captioned 'Geof [sic] & Margaret spliced'. A second photograph is missing but the caption reads 'Brian's first communion'. Photograph 1 is a vertical aerial photograph of a town on the coast. It is captioned 'Kudat Pier, Borneo'. 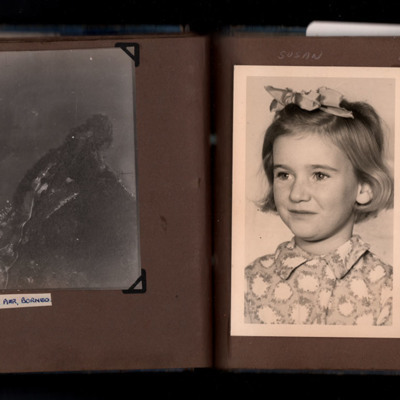 Photograph 2 is a head and shoulders portrait of a girl, captioned 'Susan'. Photograph 2 is a vertical aerial photograph of a town on the coast. It is captioned 'Jesselton, Borneo'. Photograph 1 is an air-to-air view of eight Lincolns, captioned 'Showing the flag. The start & return of trip round Malaya'. 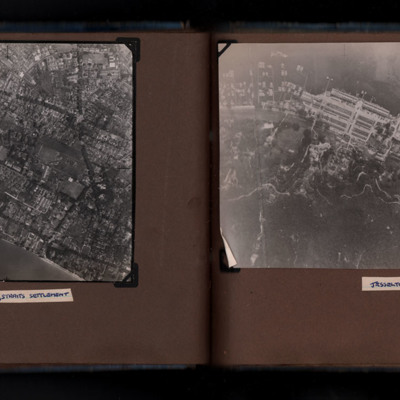 Photograph 2 is an oblique aerial view of a city and river, captioned 'Saigon, Indo-China'. 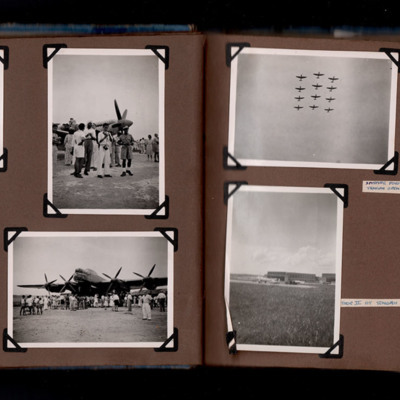 Photograph 1 is a front view of a Beaufighter. Photograph 2 is the nose of a Spitfire. Photograph 3 is a Vampire flying by. Photograph 4 is front view of a Lincoln. Photograph 1 is a temple, captioned 'Hindu Temple'. 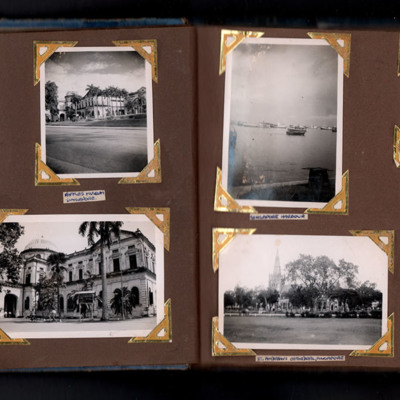 Photograph 2 is small boats, captioned 'Sampans, Singapore Harbour'. Photograph 3 is a cart and bullock, captioned 'Native transport'. Photograph 4 is a street scene. Photograph 2 a mosque captioned 'Moslem mosque Singapore. 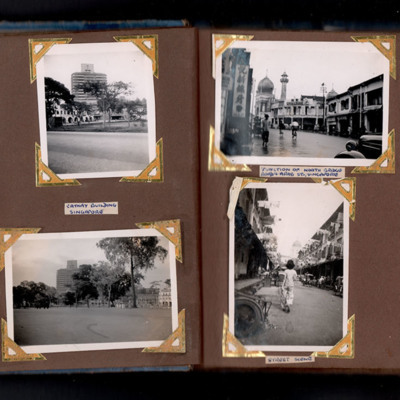 Photograph 3 and 4 a building captioned 'Cathay building Singapore'. 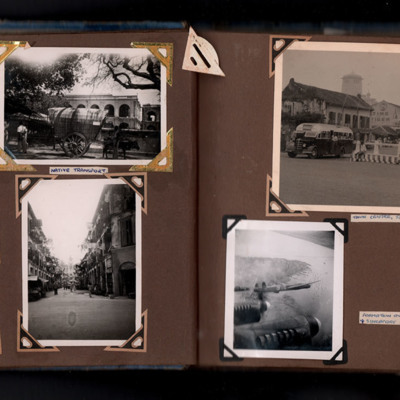 Photograph 1 is a street scene captioned 'Changi village, Singapore'. Photograph 2 is three people at work, captioned 'Native weavers, Changi village, Singapore'. Photograph 1 is of a snake charmer. Behind is the Celanes government building. It is captioned ' Snake Charmer -Colombo, Ceylon & Celanese Government building'. Photograph 1 is the Capitol, Washington taken from an aircraft and partly obscured by an engine, captioned 'Capitol building, Washington D.C. 1947'. 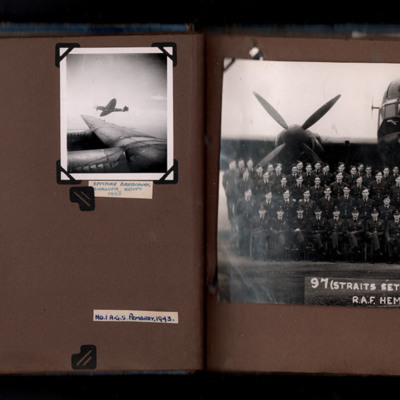 Photograph 1 is a head and shoulders portrait of an airman with a side cap, captioned 'Paddy Hamilton'. 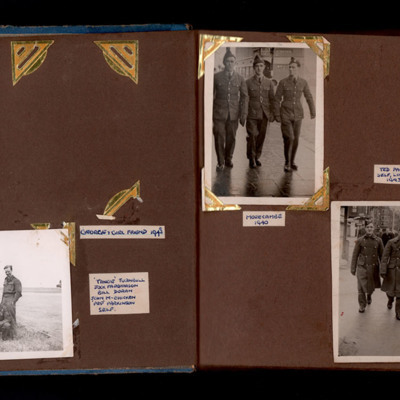 Photograph 2 is a three quarters portrait of James Wrigley in a sidcot flying suit, captioned 'Yatesbury 1941'. Photograph 1 is a head and shoulders of a man in a jacket shirt and tie, captioned 'Brother Sam 1948'. 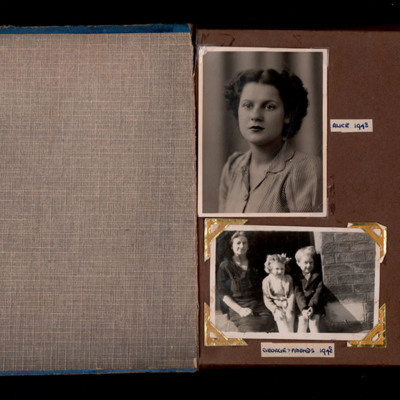 Photograph 2 is missing, captioned 'George's Girl Friend 1948'. Photograph 1 is a head and shoulders of a woman captioned 'Alice 1942'. 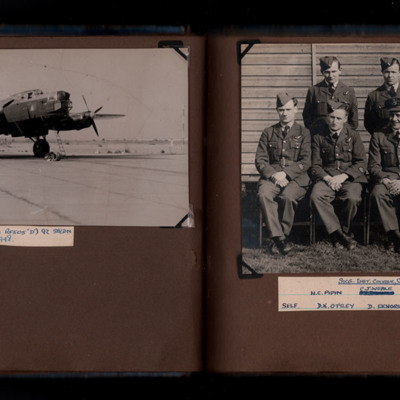 Photograph 2 is a half length image of an airman with a side cap, captioned 'Blackpool 1941'.